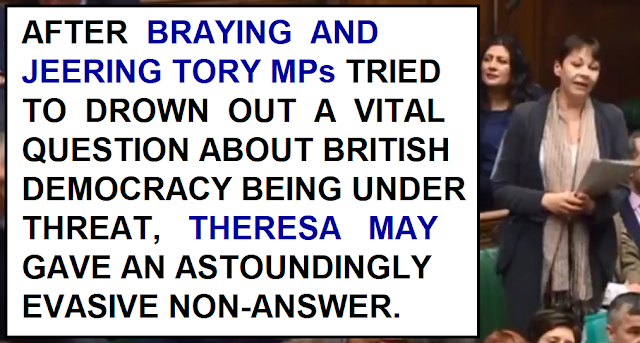 The Speaker of the House of Commons was forced to intervene when a braying and jeering mob of Tory MPs attempted to shout down a vitally important question from the Green Party MP Caroline Lucas. Once order was more-or-less restored Lucas asked her question, and staying true to her usual tactics, Theresa May waffled on about a completely different issue in reply. Tory MPs tried to shout down my question to the Prime Minister today, but I won't be silenced. The question Caroline Lucas asked was about the urgent need to update Britain's electoral rules for the digital age in order to defend democracy from unscrupulous anti-democratic practices, but Theresa May blatantly evaded answering the question in order to waffle on about data protection measures. Anyone who paid attention to the testimony of the Cambridge Analytica whistleblower Chris Wylie the day before would have been horrified at the allegations of widespread cheating of the electoral rules. Not only do the Vote Leave campaign stand accused of unlawful co-ordination with other supposedly independent Brexit campaigns like BeLeave, Wylie also made an astounding allegation that the American Billionaire Robert Mercer has used financial trickery to get around legal election spending limits. A truly extraordinary allegation: That the billionaire Robert Mercer deliberately sold Cambridge Analytica services at way below cost as a way of secretively subsidising right-wing political campaigns. The way it allegedly works is that Mercer pumps millions of dollars into Canbridge Analytica and the associated companies which then sell their psychological profiling/election-rigging products on to right-wing political campaigns at a loss. Subsidising a company so that they can provide services to right-wing political campaigns at way below cost obviously gives them a huge advantage if other parties are sticking to the electoral spending rules but buying data analytics products at their true market value. If the allegation is true, it's absolutely critical to British democracy that something is done urgently to close this loophole which essentially allows foreign billionaires to buy massive amounts of influence over our elections and referendums. After all of their rhetoric about "defending British democracy" during the referendum campaign you would have thought the Brexiteers would be all over this story like a rash, demanding action to prevent foreign billionaires from interfering with British sovereignty. When the issue was debated in parliament in the hours after Wylie gave his testimony, only seven Tory MPs bothered to turn up to the emergency debate, and the only one who made any meaningful contribution at all was the minister who was required to be there to represent the government! The conclusions are obvious. They don't give a damn about alleged foreign interference in our democratic processes as long as the outcome of the interference aligns with their own personal agenda. And they don't want to address the issue because they fear that if referendum cheating is uncovered, then their beloved Brexit might be taken away. Oh how shallow those Brexiteer referendum cries to "stand up for British democracy" ring now. Now that the very same people are determined to turn a blind eye to the extraordinary allegations about how our democratic processes have been undermined. Caroline Lucas is absolutely right. Our electoral laws need to be updated as a matter of urgency to make them suitable for the digital age. The loopholes that allow dishonest players to bypass election spending rules by flogging their services at below cost value must be shut down. The use of big data in election campaigns should be carefully regulated, not left as a total free-for-all. The use of dark ads should be stamped out. And the rules against campaign groups spreading outright lies should be strengthened and updated for the digital age.